Also serving communities of Millstadt. There are 15 Assisted Living Facilities in the Swansea area, with 3 in Swansea and 12 nearby. The average cost of assisted living in Swansea is $3,362 per month. This is higher than the national median of $3,346. Cheaper nearby regions include Fairview Heights with an average starting cost of $2,460. To help you with your search, browse the 51 reviews below for assisted living facilities in Swansea. On average, consumers rate assisted living in Swansea 4.1 out of 5 stars. Better rated regions include Fairview Heights with an average rating of 4.4 out of 5 stars. Caring.com has helped thousands of families find high-quality senior care. To speak with one of our Family Advisors about assisted living options and costs in Swansea, call (855) 863-8283. Swansea, Illinois is in the oldest county in Illinois, which is part of the American Bottom or Metro-East area of the St. Louis, MO-IL metropolitan area. The city was formed by independent residents who were worried that the neighboring village of Belleview would annex their land. Some 17.1 percent of Swansea's population of 13,518 are aged 65 or older. Fifteen assisted living facilities are in the Swansea area — three in Swansea and 12 nearby. In Swansea, as in all of Illinois, assisted living facilities (ALFs) are licensed by the Illinois Department of Public Health and must conform to regulations governing the safety of their residents and the facility's method of operation. Swansea receives more rain per year than the U.S. average, but less snow. Summer temperatures stay below 90 degrees and winter lows remain above 20. Annual sunny days are nearly equal to the national average of 205, and the Sperling's Comfort Index is 47 compared to a 54 for the country. The overall cost of living in Swansea is two points lower than the national average of 100. Housing is at 87, which is 13 percent lower than the U.S. and 5 percent below the state average. Families may find it affordable to move to this area to be near seniors in an ALF, and the low expenses may provide extra room in the budget for healthcare. The violent crime rate in Swansea is more than five points lower at 26.3 than the U.S. rating of 31.1. The annual property crime rate is 28.4, which is nearly 10 points below the national rate. ALFs offer an extra safety level with cameras and auto-locking doors, so families can feel confident that their loved ones are secure. Illinois has senior-friendly tax policies; all retirement income is exempt from state income taxes, including Social Security, pensions and withdrawals from retirement accounts. Being part of the St. Louis metro area, Metro Transit handles the public transportation needs of the residents of Swansea. Senior Reduced Fare Permits lower the fee to ride MetroBus and MetroLink by 50 percent. The Swansea area is home to world-class medical facilities, including Memorial Hospital Belleville and Touchette Regional Hospital, in the event of medical emergencies or illness. Assisted Living costs in Swansea start around $3,362 per month on average, while the nationwide average cost of assisted living is $4,000 per month, according to the latest figures from Genworth’s Cost of Care Survey. It’s important to note that assisted living rates in Swansea and the surrounding suburbs can vary widely based on factors such as location, the level of care needed, apartment size and the types of amenities offered at each community. 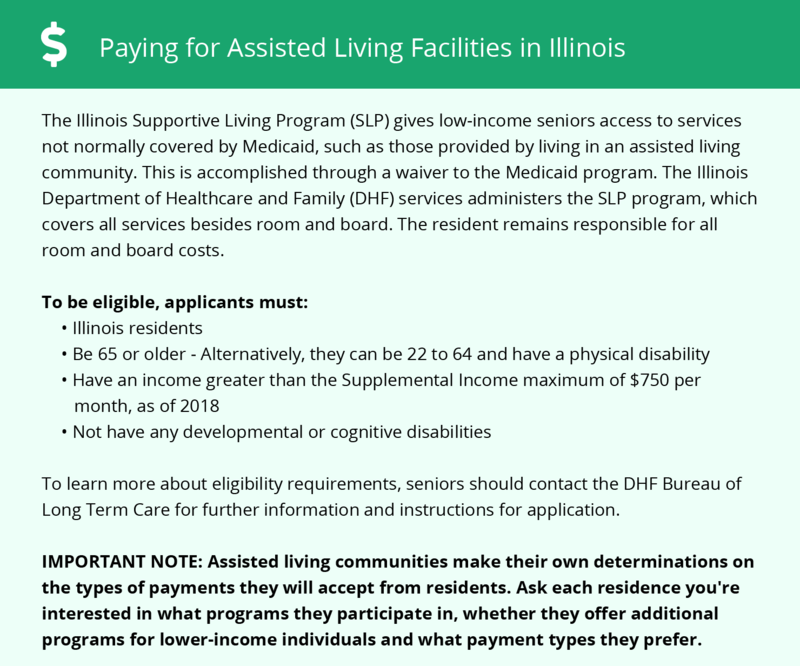 Eligible seniors may get assistance from the Community Care Program or the Illinois Supportive Living Program Medicaid waiver to help pay for assisted living services. Swansea and the surrounding area are home to numerous government agencies and non-profit organizations offering help for seniors searching for or currently residing in an assisted living community. These organizations can also provide assistance in a number of other eldercare services such as geriatric care management, elder law advice, estate planning, finding home care and health and wellness programs. To see a list of free assisted living resources in Swansea, please visit our Assisted Living in Illinois page. Swansea-area assisted living communities must adhere to the comprehensive set of state laws and regulations that all assisted living communities in Illinois are required to follow. Visit our Assisted Living in Illinois page for more information about these laws.